How Do I Search And Filter For Products On Motion Array's Marketplace? Learn how to filter your search by template category, software version compatibility, music duration, and more. Finding products on Motion Array is super easy! Just click on the Marketplace tab at the top of the screen and be taken directly to our full catalogue of products. Here you'll find our easy-to-use Search Bar to look for whatever you need. Please note that if you search for multiple keywords (e.g. "thunder" and then "rain"), the search will produce results for both keywords combined. To remove one of these keywords, just click the "X" button next to keyword on left-hand menu. Alternatively, if you want to filter your search by a particular product category, hover the mouse over the Marketplace tab at the top of the screen. This will produce a drop-down menu of all of our product categories. Once you're on our Marketplace page, you'll also be able to use the Filter Results column on the left side of the screen to narrow your search to a specific category or categories. For example, to see the results for one category (e.g. 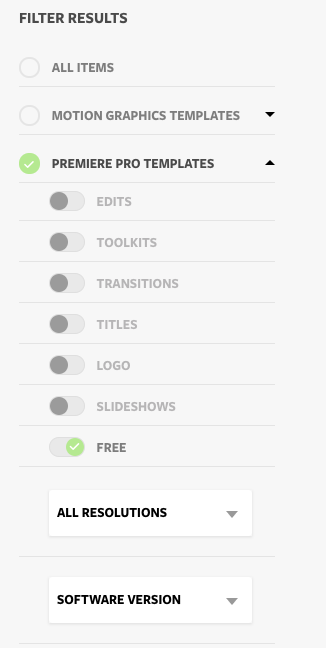 Premiere Pro Templates), select ONLY that category. Or to see the combined results for multiple specific categories (e.g. 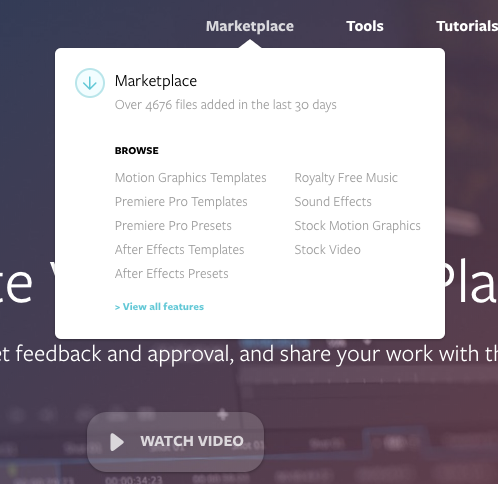 Premiere Pro Templates AND After Effects templates), select each of those specific categories. If you click on the small arrow to the right of each category, you'll see more filter options (e.g. 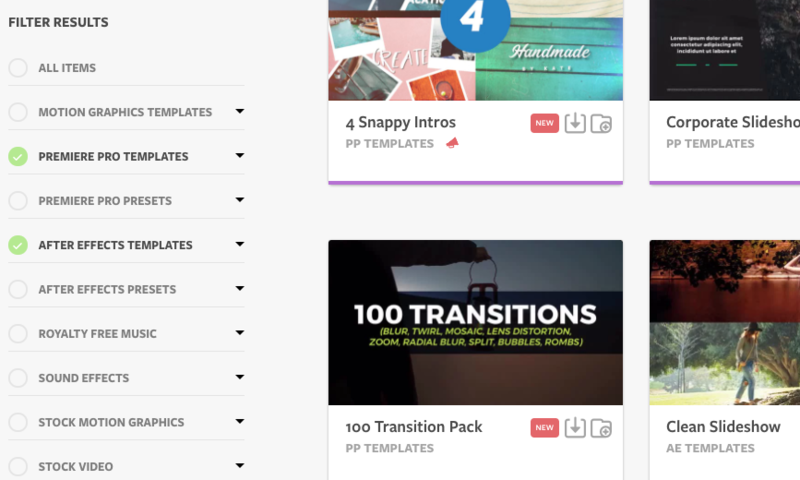 the option to display only free templates or products with a specific range of resolution). Remember: If you have more than one filter selected at the same time, your search results will display a combination of products related to each of those filters.